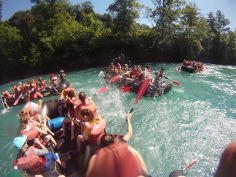 Guided trips with professional rafting boats from Thoune to Berne on the river Aare. 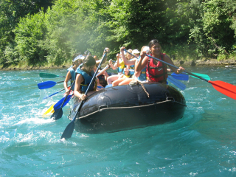 A safe and unforgettable experience for schools, companies, associations and private groups. On request there is a vehicle available to take your personal equipment from Thoune to Berne. (Costs for vehicle and driver 190.- CHF). Local train Thoune - Konolfingen, platform 18, Stop “Schwäbis“, stop on request after one minute ! (two minutes walk to the meeting point). Train tickets are not valid on the citybus! Starting at the train station of Thoune, walking towards the old town until you reach the river Aare. Follow the river left side downstream and you will arrive directly at the meeting point next to the "Regie’s bridge"
(about 15 minutes walking distance). Berne Marzili, Aarestrasse 103, 3005 Berne. The point of destination is just after the public bath "Marzili" just before the "Dalmzi bridge" on the left side. The train station Berne is a ten minutes walk away. Actual on the river time is about 3 hours. Equipment : clothing and equipment suitable to the weather conditions. The activity could be canceled due to security reasons.